IS GEORGE LILANGA A FAMILY MATTER? I visit Lilanga´s children regularly for the second year. I am their irregular neighbor since I sometimes stay in Mbagala quite near their father´s house in Sabasaba - Kwampili. I was always puzzled by their attitude to Lilanga´s work using even Sarenco´s arguments. They say that only them have right to produce Lilanga´s work because it is their right to inherit father´s legacy. 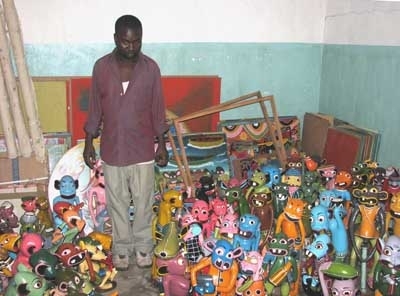 They have taken this matter up to Tanzanian court and effectively stopped the work of around 10 artists, among them Agustino Malaba who always delivered their small devils and funny paintings to George Lilanga while he was busy signing them. Sarenco, Italian curator, rightly told them that falsification of Lilanga will destroy the market. That group of artists who were employed by George Lilanga off course were still producing... They translated these advices into their own language and really acted upon it - only them have right to continue in their family matters, they say. And only them have right to sign as his father.